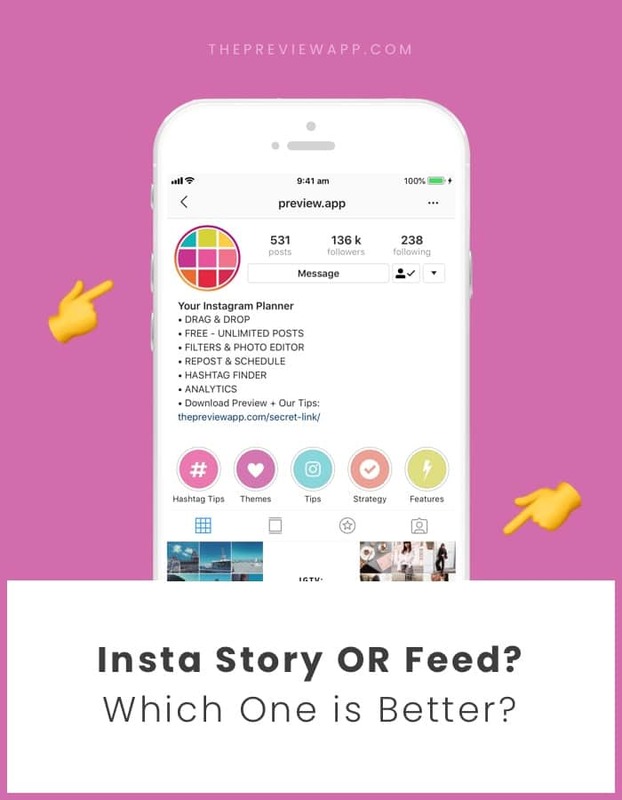 Insta Stories or Instagram Feed: Which one is better? Which one should you focus on: Insta Stories or Instagram feed? Is the instagram feed dead? Is everybody using Insta Stories only? Here’s the trick to grow your account: Your Insta Stories should complement – not replace – your Instagram feed. But does Instagram still care about your posts? Your Instagram feed is NOT dead. Instagram still cares about it. This shows that Instagram still wants you to post photos and videos. Your content can be discovered by EVEN MORE people than before. So keep posting. Keep using the right hashtags. Your Instagram feed is how people find you. Thanks to your photos and videos, your Instagram account is searchable on Instagram. How cool?! Instagram posts = fixed = they don’t disappear. You have to make a great first impression. Your Instagram theme is your visual personality, your selling point. What if people don’t search on Instagram? Your Instagram post can appear on more than 30 (!!) different places on Instagram. Yes, 30. The more hashtags you use, the more people can find your account. So keep posting high quality, engaging content. And use the right hashtags to make it easy for people to find you. Can you see the beauty of your Instagram feed? Your Instagram feed has a lot of power to grow your account. Let’s talk about Insta Stories now. This is a fact: Insta Stories disappear. Use Insta Stories to stay in touch with people, give news, show a day-in-your-life, behind the scenes, and other fun things. Her Insta Stories: Watch her Insta Stories to follow her around during her travels. She shares her behind the scenes when she’s getting ready for her adventures or writing new blog posts. Her Stories complement – but does not replace – her Instagram feed. So which one is better? Insta Stories of Instagram feed? I say they both play different roles. Think of your Instagram feed as the cover of a book: it is fixed. It’s your free advertising. People look at it first before buying it and reading it. So you have to take care of it. Your Insta Stories are the pages of the book: every day a new page, a new chapter, a new story. Your Instagram Feed and Insta Stories are two amazing tools Instagram gives us. I hope this article made you fall in love with your Instagram feed all over again and that you are excited to create! Please leave me a comment below if you have any questions.